If you love NetEnt slots, the latest Royal Panda promotion is just for you. You can earn up to 75 Royal spins on Witchcraft Academy, the latest title from the Swedish gaming giant. This casino promotion runs over three days, between Wednesday 13th and Friday 15th June. Pick up 25 Royal spins per day and keep those fingers crossed for big wins. Casino free spins are an excellent way to try out new games without risking your bankroll. Of course, you are likely to love anything that NetEnt creates, but why not grab this opportunity with both hands? You might even hit the jackpot; you never know! During the three days of the Royal Panda promotion, you can earn a total of 75 Royal spins on Witchcraft Academy. Each Royal spin is worth £2 – that’s £150 worth of spins! Try this exciting new slots game out in addition to your normal fun gaming at the excellent Royal Panda casino. To earn the free spins, you just need to deposit funds. To earn the full 75 Royal spins, you need to deposit £250 or more on each of the three days. However, you can claim 40 standard free spins each day (a potential total of 120) by funding your account with between £150 and £250 each day. There’s also the chance to earn 25 standard spins per day by depositing between £25 and £150 per day. 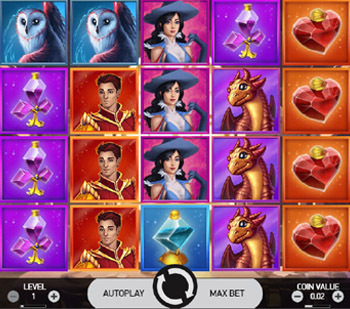 You can also mix and match; earning 25 Royal spins on one day, 40 standard spins on the next and 25 regula casino free spins on the third, for example. You pick up the highest value prize for which you are liable each day. You have until 23:59 CEST (an hour ahead of the UK) each day to make a qualifying deposit. The spins appear in your account at noon CEST the next day. Royal spins are big money affairs, worth £2 each, making a total of £150 worth of spinning fun. Normal free spins at Royal Panda are played at the minimum spin cost, as is standard at UK casino sites. In the case of Witchcraft Academy, that is 20p per spin. Even just collecting the maximum number of regular free spins is worth £24 and can lead to big wins on this new slots game from NetEnt. When you win prizes in your free spins or Royal spins you need to meet the wagering requirements to be able to withdraw them as cash. This is to ensure you don’t just qualify for the spins, win prizes and take all your money out straight away. It would not be possible for new casino sites to offer such deals if everyone did this. The playthrough requirement means you have to play stakes to the value of 35x your winnings in order to withdraw them. After that, they appear as cash in your player account. 35x is fairly standard in the industry for this type of competition. You do not need to deposit more funds to play through, you simply reinvest your winnings until you achieve the 35x. Witchcraft Academy is a new online slot from NetEnt, one of the leading games providers. It plunges you into a school for magic people, with owls, potions and dragons all appearing. The main characters are a witch called Efora and Earthan, a wizard. There are five reels, four rows and 20 paylines on which to win, with a maximum prize of 800x your stake. There are also normal Wilds, stacked Wilds, free spins and the Elements Bonus game to get your teeth into. During the Elements Bonus on Witchcraft Academy, there are four different free spins options, big coin wins and more. The Scatter brings multipliers, stacked Wilds and more free spins. Although the games maker doesn’t have an official movie tie-in deal with the Harry Potter franchise, the similarities are noticeable. Presumably it is not for the want of trying, as NetEnt boasts plenty of licensing success. The latest Hollywood hook up for the Swedish firm is with Jumanji, based around the 1995 Robin Williams movie. The wizardry, spacious castle and bountiful owls make this a Harry Potter slot in all but name. This Royal Panda promotion is just one of the many reasons to play at this UK casino site. The website is good looking and remarkably easy to navigate. There are plenty of decent promotions, which update regularly. You can also take advantage of the long list of accepted payment methods. The welcome bonus isn’t the most generous, but existing players can enjoy the Friday Bamboo Bonus. It’s a deposit bonus that appears once a week , allowing to snap up a 50% bonus on amounts between £10 and £150. Hit the link below to visit Royal Panda right now, sign up and take part in this Royal Panda promotion. Alternatively, click the logo to read SpinCazino’s expert UK casino site review.